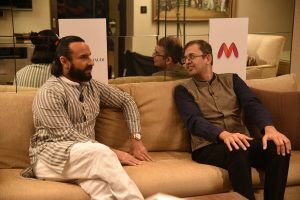 Myntra Collaborates With Bollywood Nawab For "House Of Pataudi Brand"
It has been long that we could connect to power couple of Bollywood, Saif Ali Khan and Kareena Kapoor sharin big screen together. But celebrities are cheering their fans with a amazing news that is, the two are joining hands with online portal Myntra to launch a designer ethnic-wear brand named “House Of Pataudi Brand”. Staying true to Khan’s royal lineage, the clothing brand’s offerings will be inspired by the heritage of royal gharanas of India. A lack of organised ethnic wear brands in the country has led Flipkart-owned fashion e-tailer Myntra to invest in some brands that can propel the diverse ethnic range in the country. 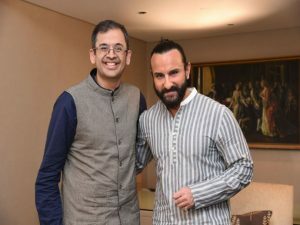 “We are very excited to partner with Saif and Exceed Entertainment to launch, ‘House of Pataudi’, a first of its kind brand in the country that embodies royalty and a rich cultural heritage,” said Ananth Narayanan, CEO, Myntra-Jabong. “House of Pataudi for me is an extension of my family legacy. From the way it has shaped up, I could tell House of Pataudi is a tasteful curation of Indian ethnicity and finer sensibilities bordering on the Pataudi heritage. Fashion and history are two areas I have personally been inclined towards over the years and am happy that we are taking a part of the Pataudi Legacy forward through this brand” said Saif Ali Khan. Myntra expects House of Pataudi to have good potential as India lacks ethnic wear brands in the country. Myntra also plans to launch stores for some of its other private labels. The Flipkart owned company aims to launch 100 stores in the next two years, of which 50 will be Roadster stores, followed by HRX. The range includes kurtas, sherwanis, dresses and others in a price range of Rs 1,500 to 15,000 for men and Rs 2,000 to 20,000 for women exclusively on Myntra and Jabong from October 25.